On the 8th of May, Donald Trump gave a long-winded speech ending in his announcement that he is repudiating the Iran nuclear deal and re-imposing sanctions. 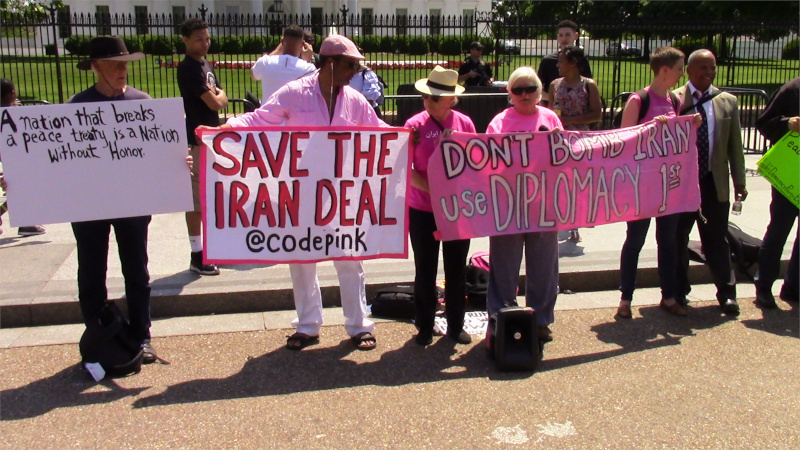 Code Pink protested outside as Trump commited the US to another in 500 years of broken treaties. Code Pink compared Trump's speech to Bush's announcment about WMD in Iraq that led to war. After Trump wrapped up, a few pro-Trump MAGATs tried to disrupt Code Pink's speakers but were outnumbered and out-argued. As for Trump, he should flush his mouth after that speech. With US negotiators now en route to North Korea, North Korea has just been sent a message that treaties with the United States are not worth the paper they are written on. Of course, this has been true of the US and its British settler antecedents for 500 years. In more recent terms, one of Donald Trump's first acts in office was to again violate the Ft Laramie treaty with the Lakota by approving the Dakota Access Pipeline.